While the tool set may differ, the ultimate goal of CT today is providing the highest quality image with the lowest possible radiation dose. With recent news coverage of potentially dangerous dose levels, many hospitals and imaging centers are looking closely at their equipment and considering options that could provide some resolution. Regardless of the manufacturer in the CT marketplace, research and development efforts will continue to focus on faster scan times, higher quality images, and reduced radiation doses. Where variations may arise are in the applications for these diagnostic tools. The following are some of the latest CT industry offerings. GE Healthcare approaches the issues of dose and image quality at the data level with its Adaptive Statistical Iterative Reconstruction (ASiR) technology, included in both the Discovery CT750 HD and LightSpeed VCT XTe models. With ASiR, GE reports an up to 50% dose reduction across the whole body and 83% reduction for cardiac exams while at the same time maintaining image quality. Currently, all image reconstruction algorithms for commercial CT involve filtered backprojection, which is applied once the last projection view process is complete and images are generated. While this method is simple and fast, Shah says drawbacks include sensitivity to noise and artifacts. With the ASiR technology, there is no filter but rather the algorithm is applied to the raw data. This method uses iterative reconstruction that, as much as possible, mimics the process of real CT scanning. It extracts noise by synthesizing new projections and then compares them with original projections in a statistical way. It then iteratively corrects the raw data until the image quality criteria is satisfactory. ASiR maps and corrects the unwanted noise, reducing the required dose for high-quality imaging. The dose reduction and high image quality provided by ASiR is especially beneficial in at-risk populations such as children and young women. However, Shah says it is GE’s goal to apply this lower dose technology across all its CT product lines. In addition to the Discovery and LightSpeed models, ASiR is currently available in its 16-slice BrightSpeed device, although that model is not yet approved for use in the United States. GE Healthcare also offers CT scans with the clarity of high definition combined with a detector that increases speed and efficiency with its Discovery CT750 HD. Using Gemstone Spectral Imaging, this machine improves low-contrast detectability and soft tissue contrast, making it easier to see smaller objects. “The ability to see and characterize a lesion that’s less than 1.5 cm is key to the clinical diagnosis,” Shah says. The advent of faster, inexpensive computers enabled NeuroLogica to develop its RadRedux technology with algorithms that filter out noise while preserving signal quality, resulting in images with better contrast resolution without increased doses. RadRedux enables the company’s CereTom portable CT scanner to acquire images at up to 50% dose reduction from original settings. Lesions are better detected in CT images with this technology, he says, but are never completely processed out of the image. Pixels are examined so that only those belonging to the same anatomical structures are grouped and filtered together, reducing noise while maintaining anatomical edges. The postreconstruction filter was designed to work similarly to military synthetic aperture radar systems that attempt to filter out noise while preserving signal quality. The algorithms necessary to make this happen require intense computations; however, Lee notes that advancements in the computer technology now available for use by hospitals and imaging centers enable this technology to work in the world of everyday CT imaging. Philips Healthcare’s new dose-reduction technique, iDose, expands the company’s DoseWise suite of radiation management tools. The iDose reconstruction technique, called RapidView IR console, enables reconstruction that is 20 times faster than current hardware and lowers x-ray dose up to 80% while maintaining diagnostic image quality. Developing new algorithms can include numerous barriers, Reimer explains. Software engineers work to find methods that reduce dose yet maintain or improve image quality, but that process takes time, he says. In addition, revisions such as this require significant hardware and computing power. However, engineers at Philips are confident they’ve harnessed the latest technological advancements that make calculating new algorithms easier. While reducing doses is important, Philips technology also focuses on maintaining an efficient image chain. Reimer says that aspect is dependent on how the detector is designed, a feature Philips addressed two years ago with new detector technology. “We had already reduced doses on the hardware side,” he says. iDose has been cleared by the FDA and is available for new and installed base Brilliance iCT and 64-channel scanners, with expected delivery in the second half of 2010. Reimer sees a future for CT in emerging markets, but making the technology easier to use would better ensure increased demand. Improved throughput is another future goal for CT technology at Philips. Developments in high-quality imaging are tailored toward moving more patients through the CT scan process by reducing the number of second exams. 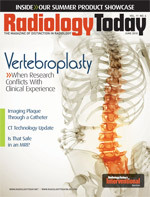 “The better the imaging, the less time patients need to spend on the table,” Reimer says. Siemens Healthcare’s Somatom Definition Flash is the company’s second-generation dual CT scanner. This version incorporates Flash Spiral technology that simultaneously integrates data from a second source during a scan, resulting in scan speeds fast enough to cover an entire body in less than 5 seconds. Speed is also helpful when imaging pediatric patients, he says. In many cases, children must be sedated to ensure that images are clear the first time. Repeat imaging means increased doses. However, sedating a child is not something physicians or patients desire. In addition, there is a negative impact on the workflow in an imaging setting. “With the Flash, sedation is optional,” Gungor says. The SOMATOM Definition Flash’s adaptive 4D spiral-plus feature allows for complete coverage by a static detector with continuously repeated bidirectional table movements. The technique allows for up to 48-cm dynamic coverage at the lowest possible dose. Another development from Siemens is its Iterative Reconstruction in Image Space (IRIS). This new algorithm for the reconstruction of sectional views from CT raw data makes better use of the information contained in the source data while at the same time is much faster than previous approaches to iterative processes, despite additional reconstruction steps. Compared with the filtered backprojection method of image reconstruction, IRIS can either generate the same image quality and reduce the dose by up to 60% or maintain the same dose and generate significantly better image quality than with filtered backprojection. As Gungor explains, this technique has been available for some time as a concept but was not practical due to lengthy reconstruction times or relatively poor image impression. However, the IRIS algorithm accelerates image reconstruction while ensuring the best possible image impression. All raw data are transferred to a more efficient image data area in the first reconstruction cycle, resulting in a master image that contains fine details but significant image noise. That noise is gradually cleared, eliminating the need for time-consuming backprojections. Most products under the SOMATOM Definition family will be equipped with IRIS beginning in the second quarter of 2010. Toshiba’s Aquilion ONE has the ability to image an entire organ in a single rotation and show dynamic function such as blood flow. It is suited to serve the needs of the pediatric market with a high-quality CT exam tailored for young patients by reducing radiation doses and lessening the need for sedation. In addition, the Aquilion ONE is valuable in the diagnosis of neurological conditions such as stroke. The Aquilion ONE can image a patient in 0.35 seconds as opposed to the 4 to 5 seconds required with conventional helical CT scans, meaning patients can move sooner during a scan without compromising image quality. Consequently, less patient sedation is required. Patients are also exposed to less radiation with faster scan times. According to Robb Young, senior manager of Toshiba’s CT business unit, Aquilion ONE’s rapid acquisition time reduces radiation exposure by up to 80%, capturing up to 16 cm of anatomy in a single gantry rotation. Young explains that Toshiba’s equipment is designed for a specific population instead of being a one-size-fits-all solution. For pediatric patients, the Aquilion ONE is available with a kit that includes several child-friendly accessories and features. For stroke diagnosis, the Aquilion ONE can assist in providing a comprehensive exam by scanning an entire organ, such as the brain, in a single x-ray rotation with no contrast, as well as a follow-up single-injection scan. The system uses 320 ultra­high-resolution detector rows, 0.5 mm wide, and can also show real-time dynamic organ function, such as blood flowing through the brain, in a 4D video format. Aquilion ONE utilizes the Singular Value Decomposition Plus delay-insensitive perfusion algorithm that uses a technique that accounts for delays between the arterial input function and the tissue curve, corrects for noise, and performs calculations with fast computation times. The algorithm shifts the artery curve so that it always begins just prior to the contrast arriving in the tissue curve. Since time is essential in stroke diagnosis, the Aquilion ONE acquires up to 16 cm of anatomy in one rotation in as fast as 0.35 seconds, Young says. At that speed, one scan could cover the entire brain. Young sees the coverage, speed, and low-dose benefits of the Aquilion ONE for widespread use by hospitals, including emergency departments, for patients presenting with neurological symptoms or even chest pain.